A new miracle in Quicklighting Charcoal has been found with the introduction of the Miraculum brand. Miraculum Charcoal's formula allows for the charcoal to light faster as well as maintain a more even and consistent burn throughout without interfering with the flavor of tobacco, making it the most sought after quicklighting charcoal brand available. 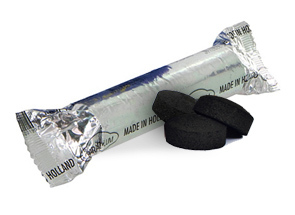 These Charcoals are manufactured in Holland, and are specifically designed for smoking with the Hookah. Each roll of Miraculum Charcoal contains ten individual charcoals.